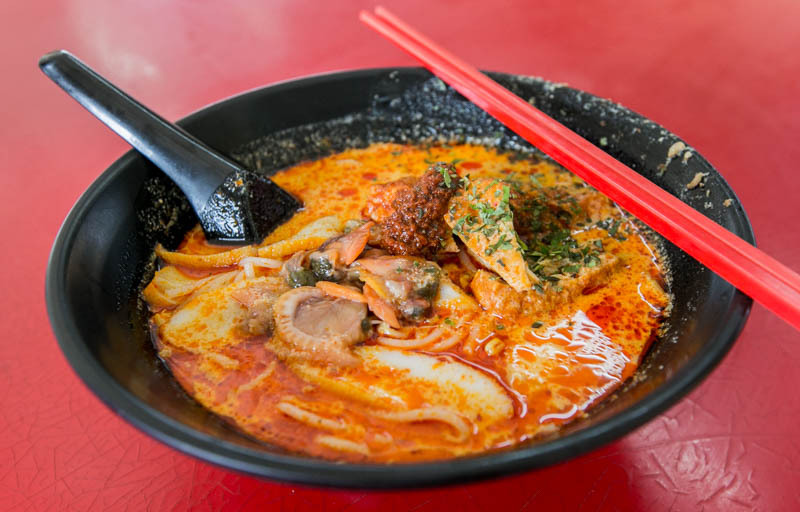 While Crazy Rich Asians may have set off a buzz about the fancy hawker fares at Newton Food Centre, only a true Singaporean will know that the real gem can only be found in the heartlands. 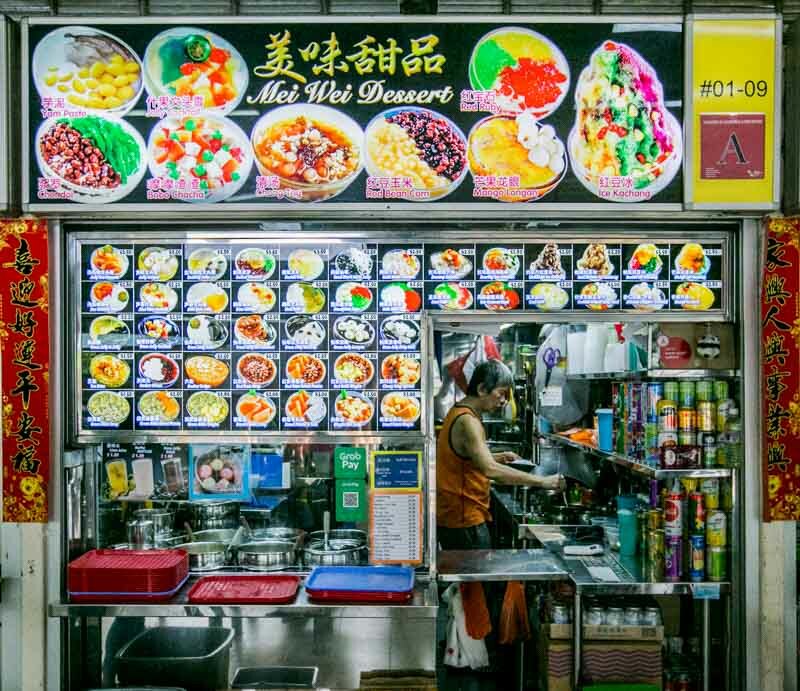 While it may not feature Michelin-starred hawker stalls, I can assure you that the food at Kovan 209 Market & Food Centre will give tourist traps (pretty sure you know which ones I’m referring to) a good run for their money. 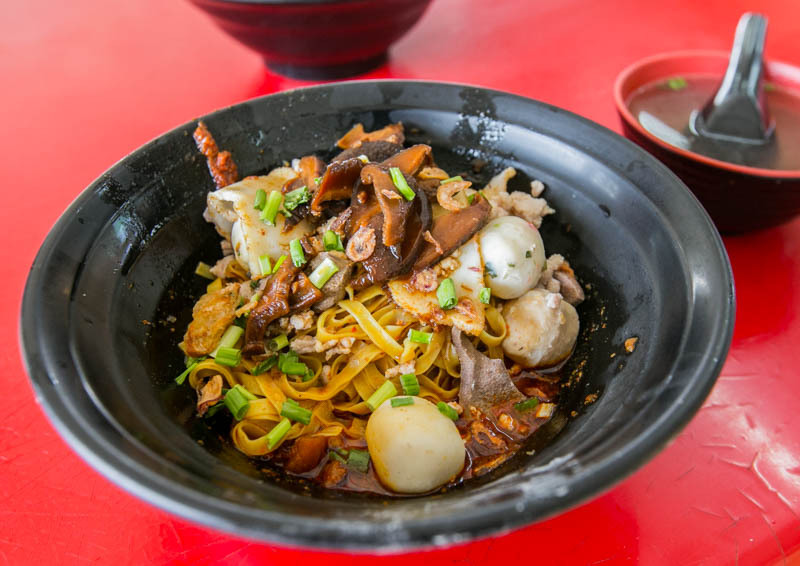 So here’s a list of 10 hawker stalls you have to try if you’re in Kovan, and you may just agree with me that the North-East region in Singapore is truly the best. At 4pm in the afternoon, business is usually pretty slow in hawker centres — but not for 发笋粿 Fatt Soon Kueh. 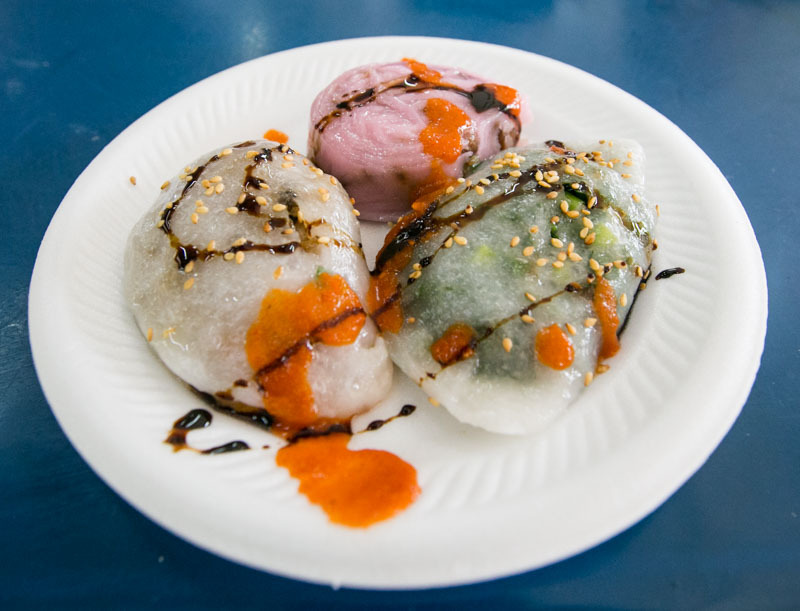 For S$3, you get to pick a selection of three kuehs. We decided to try one of each, namely their Rice Kueh, Ku Chai Kueh (Chives) and Soon Kueh (Turnip). Upon taking our first bite, it’s not hard to see why there was a queue. The delicate and translucent kueh skin was thin, yet it was able to retain a nice, chewy texture. So if you’re looking for a quick breakfast option or a midday snack, I would definitely recommend this! 发笋粿 Fatt Soon Kueh: #01-17 | Opening hours: 7.30am – 6.30pm (Mon – Sat), Closed on Sundays. 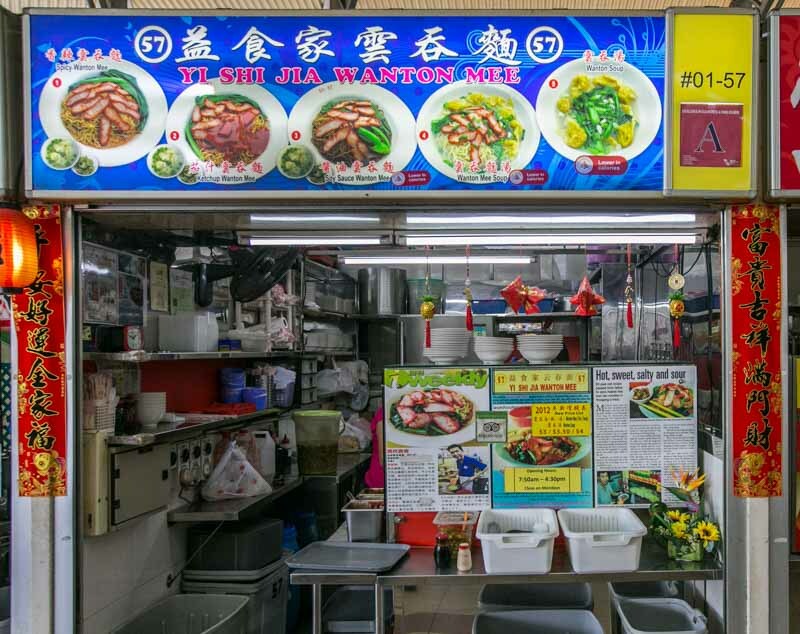 Those that frequent this hawker centre will most likely be familiar with 益食家云吞面 Yi Shi Jia Wanton Mee that has been around for decades. As I waited in line, an elderly lady told me she has patronised this shop for over 30 years, and up to this day, she’s still a loyal customer. You can choose between the soup or dry version for your wanton noodles. The latter is available in three different flavours — Chilli, Ketchup or Soy Sauce. 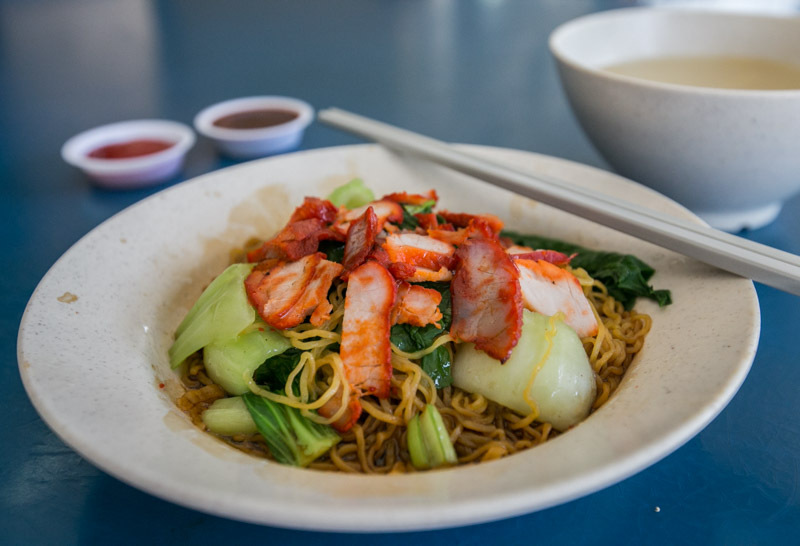 The Soy Sauce Wanton Mee (S$4) came with char siew, vegetables and a bowl of dumpling soup. It was a simple and honest bowl of noodles, nothing extravagant, yet I loved its simplicity. The noodles had a nice texture and the chilli sauce gave it an extra oomph which I loved. The dumplings were delicious as well and they were definitely not stingy with the fillings. I guess my only issue was that the char siew was a tad dry. 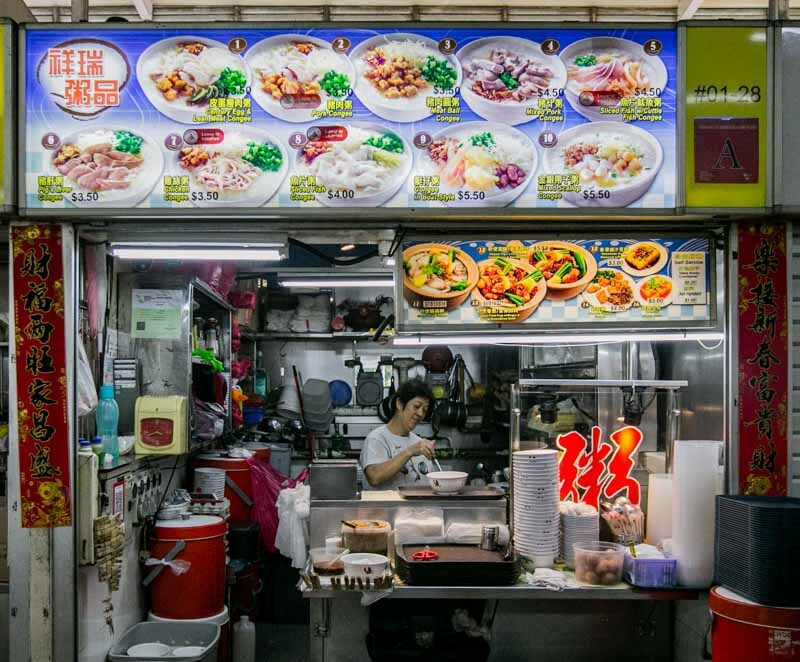 However, I do see myself heading back again for a no-frills bowl of old-school wanton mee if I’m in the vicinity — do take note though, that they are usually sold out pretty early in the afternoon. 益食家云吞面 Yi Shi Jia Wanton Mee: #01-57 | Opening hours: 8am – 4.30pm (Tue – Sun), Closed on Mondays. 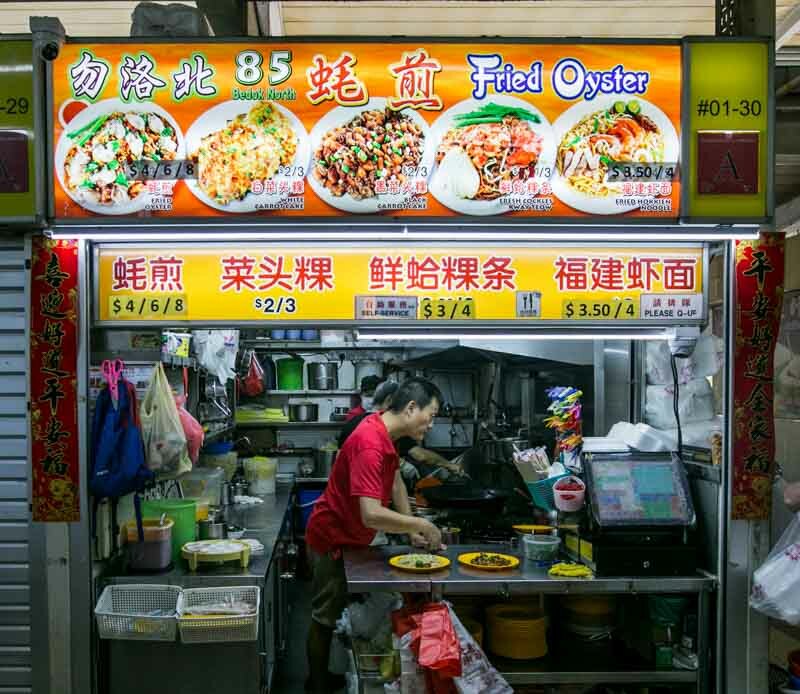 I honestly feel that Bedok North 85 Fried Oyster is one of the more underrated Hokkien mee stalls. It is one of my go-to places to get my favourite local delight. 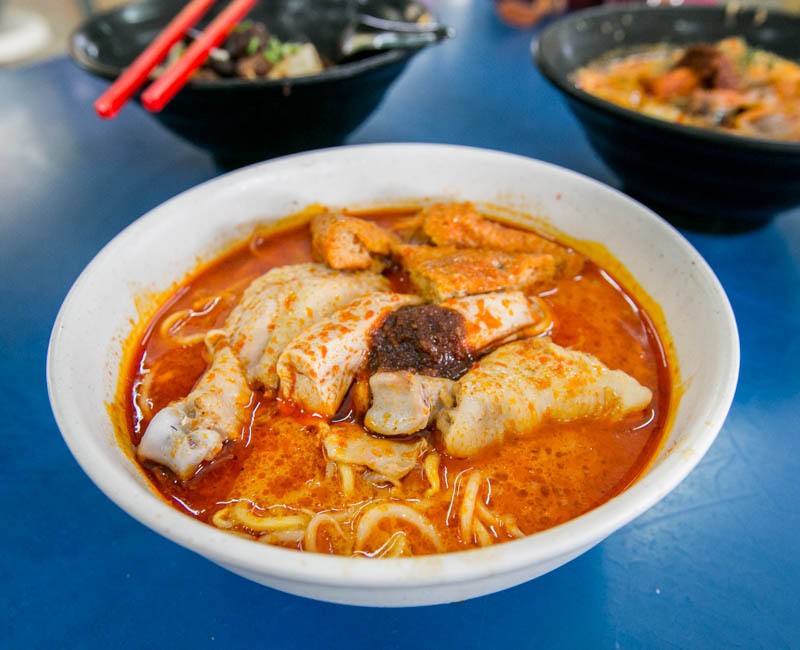 If you’re a fan of the soupier kind of Hokkien mee, you’ll enjoy this. 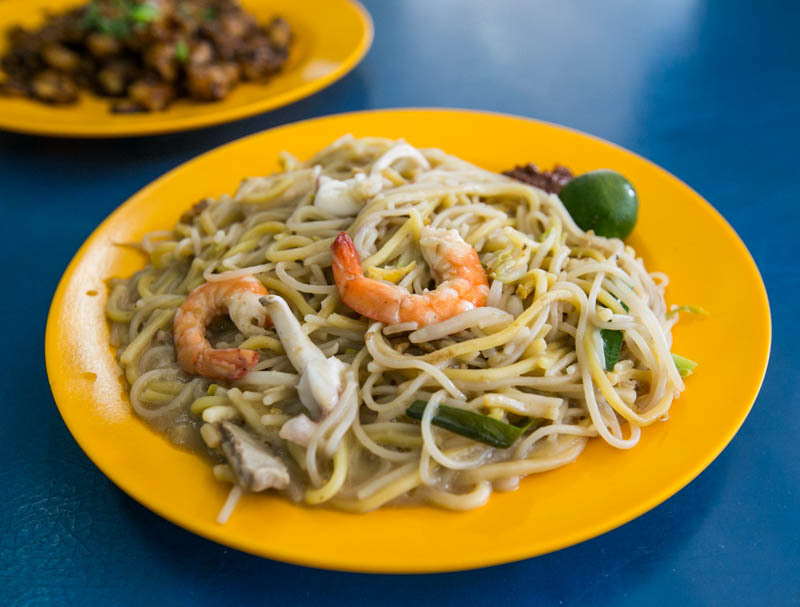 Their Hokkien Mee (S$3.50) is moist yet not too watery and the noodles are well-coated with the thick, savoury prawn broth. When I saw my all-time favourite breakfast item — Black Carrot Cake (S$2) available, I knew I had to get it. 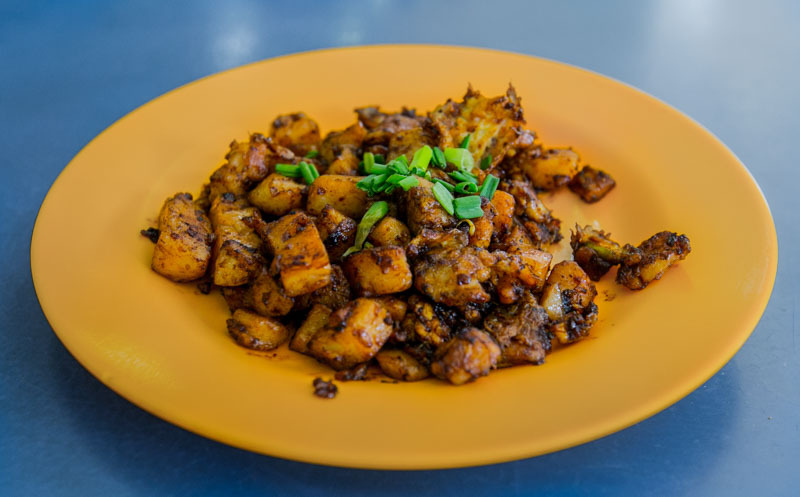 The cubes of radish cake are stir-fried with chye poh (preserved radish bits), eggs, dark soy sauce and garnished with spring onions before it is served. Albeit on the saltier side, it was still a pretty decent plate of chai tow kuay and considering that it’s just S$2, I would say that it’s definitely worth it! 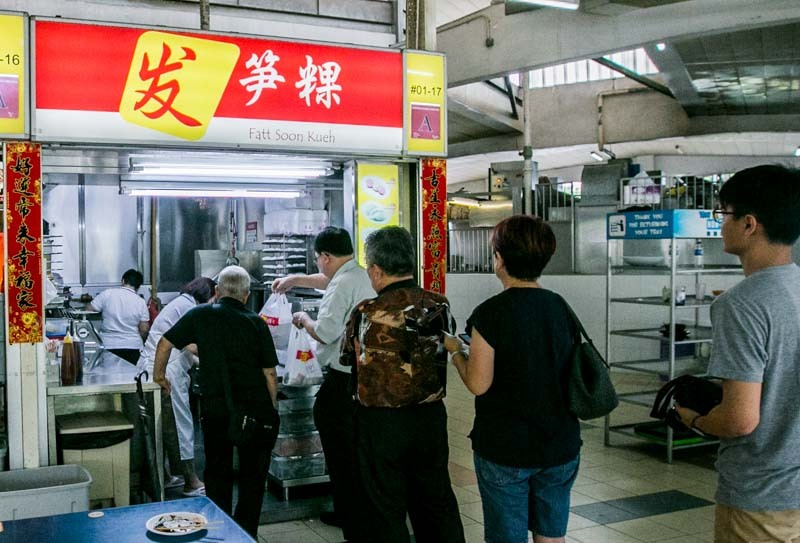 Another one of the crowd favourites, there’s always a queue in front of this chye png stall during lunch. 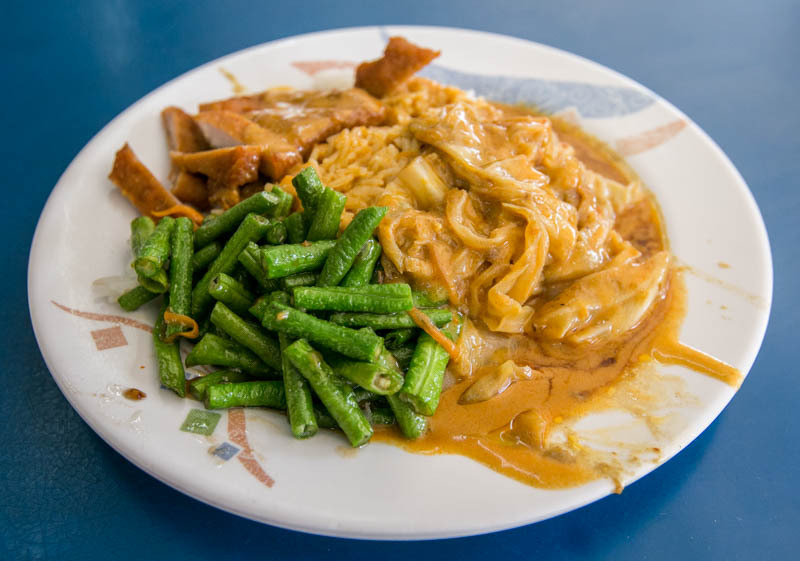 Our plate of Hainanese Curry Rice (S$3.80) came heaped with stir-fried long beans and Hainanese pork chop, drenched with curry vegetables. The curry was not bad, but the pork chop was slightly cold and wasn’t as crispy as we had expected it to be. However, for S$3.80 (and considering the fairly generous portions), I’ve got no complaints. 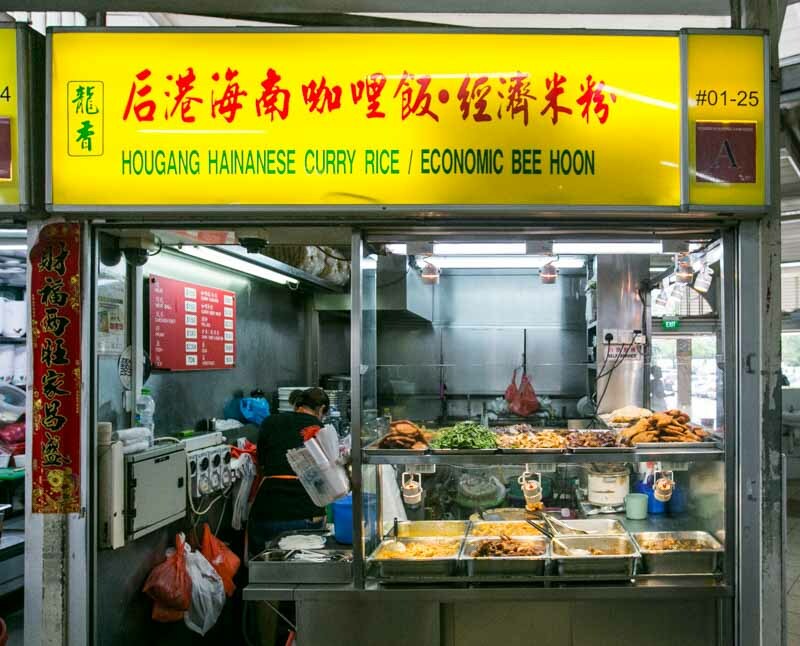 后港海南咖喱饭·经济米粉 Hougang Hainanese Curry Rice / Economic Bee Hoon: #01-25 | Opening hours: 8.30 – 10pm (daily), Closed on Fridays. Whenever I feel under the weather, I’ll have a craving for porridge from 祥瑞粥品 Xiang Rui Porridge, and in particular, their Congee in Boat Style (S$5.50). 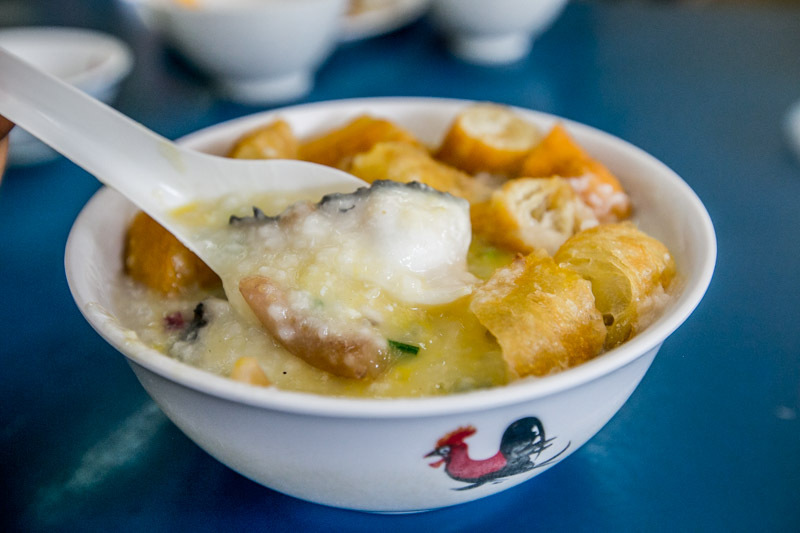 It is like a seafood porridge, consisting of ingredients such as sliced fish and cuttlefish. Do not underestimate this unassuming bowl of porridge. 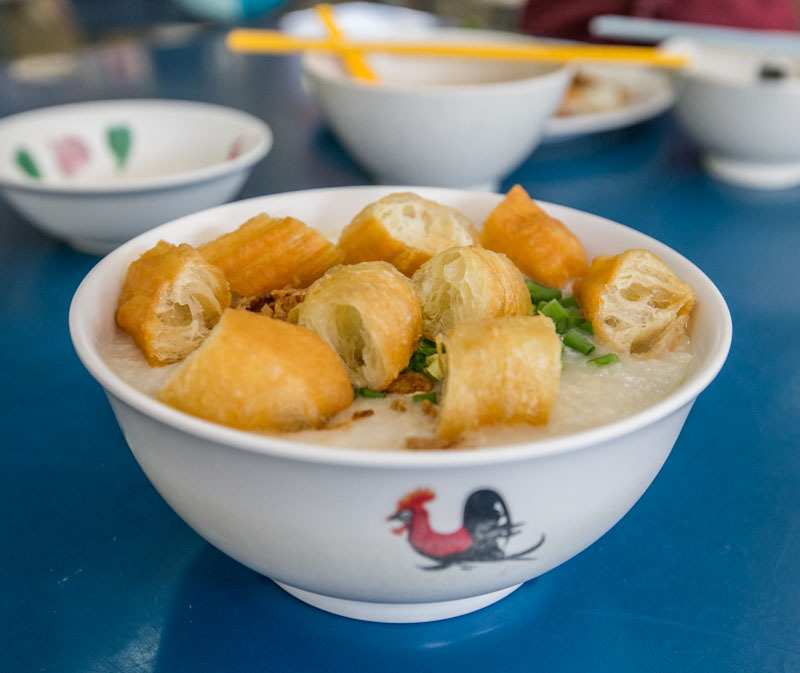 It is extremely comforting and the congee has a nice, thick consistency to it. A stick of crisp, fresh you tiao is served with the porridge and you can request for them to cut it (just like we did! ), else it’ll be served perched on the rim of the bowl to prevent it from becoming soggy. Many of our followers responded to our IG story, telling us to try the “BCM with the long queue” at Kovan 209 Market & Food Centre. 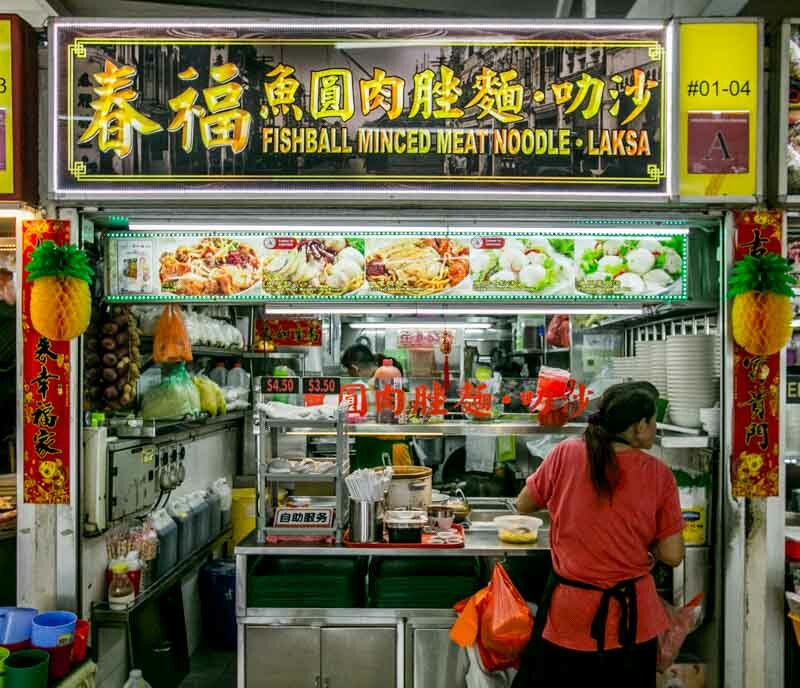 However, as we stood in front of Fa Ji Minced Meat Fishball Noodle and its neighbouring stall, Chun Fu Fishball Minced Meat Noodle • Laksa, we could not tell the difference as their menus were almost identical… and had both equally long queues! So being a typical kiasu Singaporean, we decided to try the BCM with a longer queue (to be honest, it was probably just a difference of one or two people). Upon taking my first bite of the Minced Meat Noodle (S$3.50), I was slightly disappointed. Don’t get me wrong, it was a decent bowl of noodles, but given its popularity with the crowd, I had expected a lot more from it. However, if I have to pick one thing that I liked about this bowl of noodles, it would be the mushrooms. Having soaked up the sauce, they were very juicy and flavourful, contributing to the overall taste of the BCM. Their Laksa (S$3.50) was not bad as well, but I felt that there was a bit too much coconut milk, as the laksa was a tad too milky for my liking. Like the BCM, they’re quite generous with the ingredients, including the hum (cockles), which were significantly bigger and juicier than those found elsewhere. 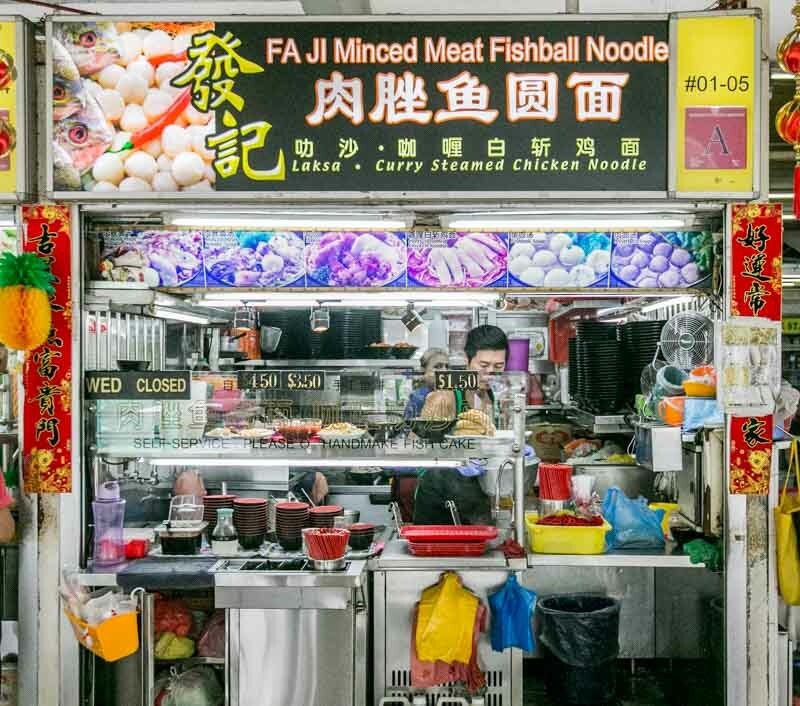 发记 Fa Ji Minced Meat Fishball Noodle: #01-05 | Opening hours: 7.30am – 9pm (Mon, Tue, Thu & Fri), 7.30am – 7.30pm (Sat & Sun), Closed on Wednesdays. We decided that since we were already queuing for Fa Ji Minced Meat Fishball Noodle just next to it, we might as well “split” our manpower and queue up at Chun Fu Fishball Minced Meat Noodle • Laksa too. 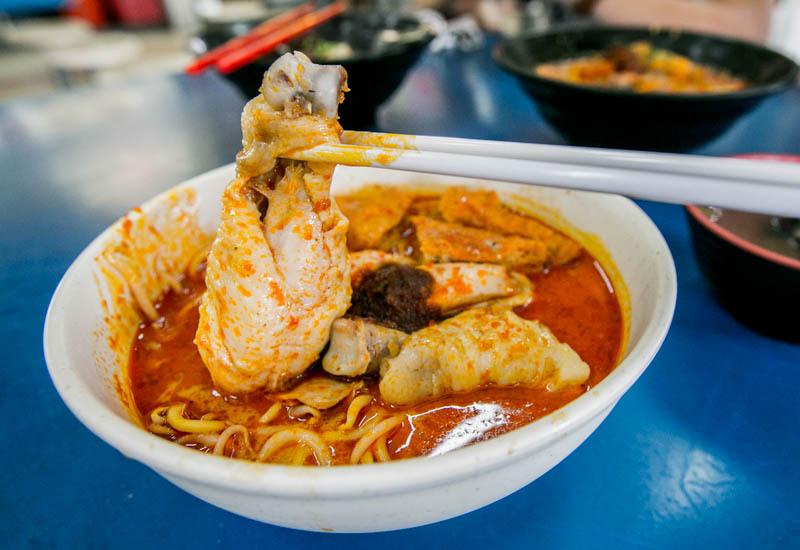 The Curry Chicken Noodle (S$3.50) seemed like a crowd favourite, so we decided to go get a bowl. And I’m glad we did, as this is honestly one of the best curry chicken noodles I have ever had. We mixed the chilli into the broth, and there was only one word that could describe the taste — Shiok! 春福 Chun Fu Fishball Minced Meat Noodle • Laksa: #01-04 | Opening hours: 10.30am – 9pm (Wed – Mon), Closed on Tuesdays. 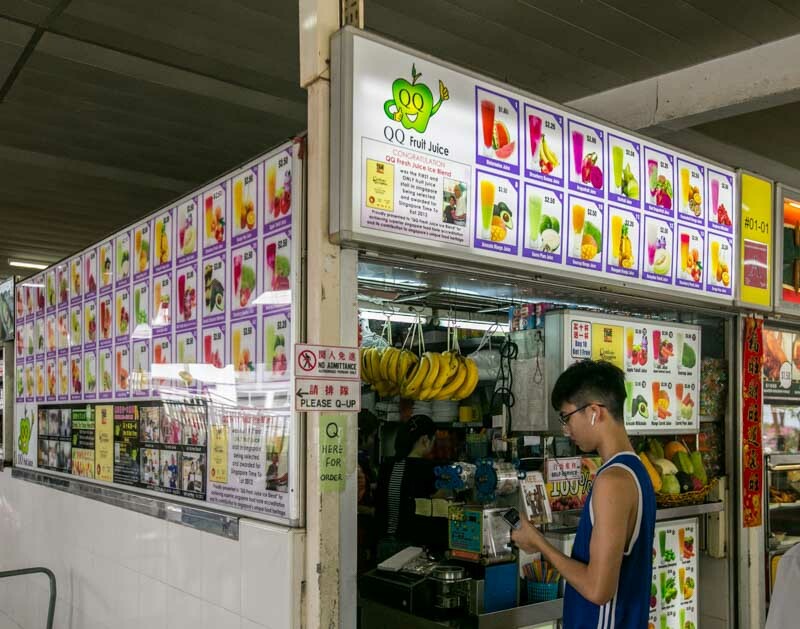 Fruit juice stalls are a dime a dozen, but did you know that QQ Fruit Juice is the first and only fruit juice stall to be selected and awarded for Singapore Time to Eat 2012? From Raspberry Milkshake (S$2.50) to Passionfruit Orange Juice (S$2.50), they offer a huge variety of juices and milkshakes that are not commonly found in other fruit juice stalls. 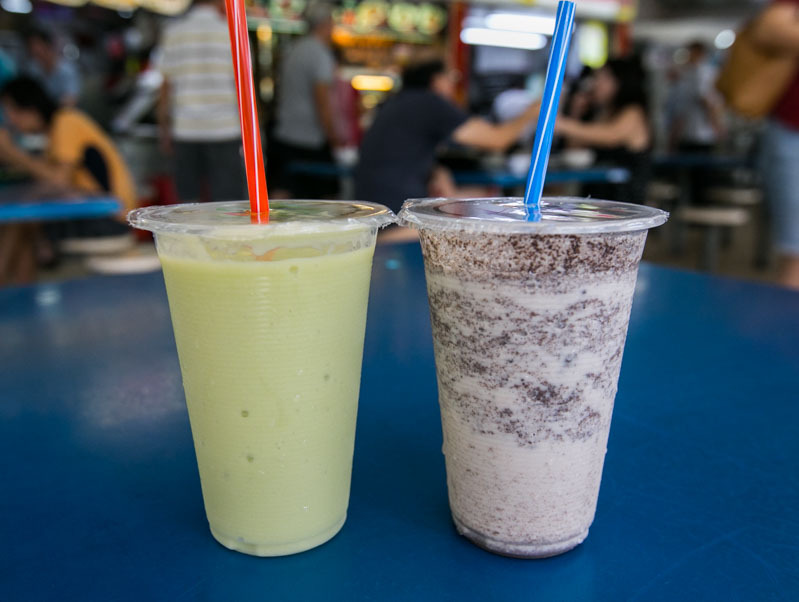 Unique flavours aside, their Avocado Milkshake (S$2.80) and Vanilla Oreo Milkshake (S$3) did not disappoint. The former was smooth and creamy, while the latter tasted like the old-school ice-blended drinks you can find at HDB void decks. 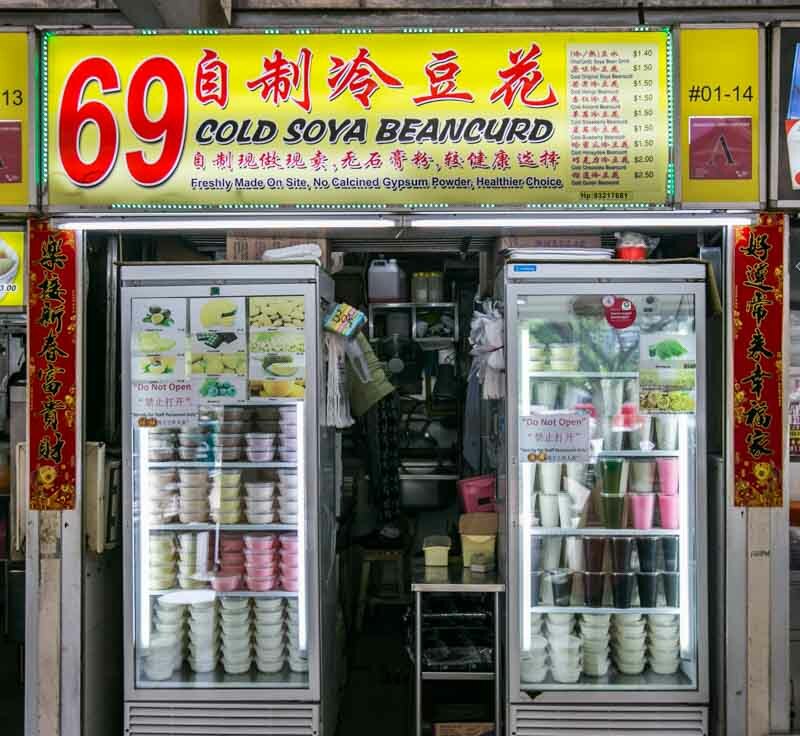 69 Cold Soya Beancurd is like the siew dai (less sugar) version of everybody’s favourite Lao Ban. 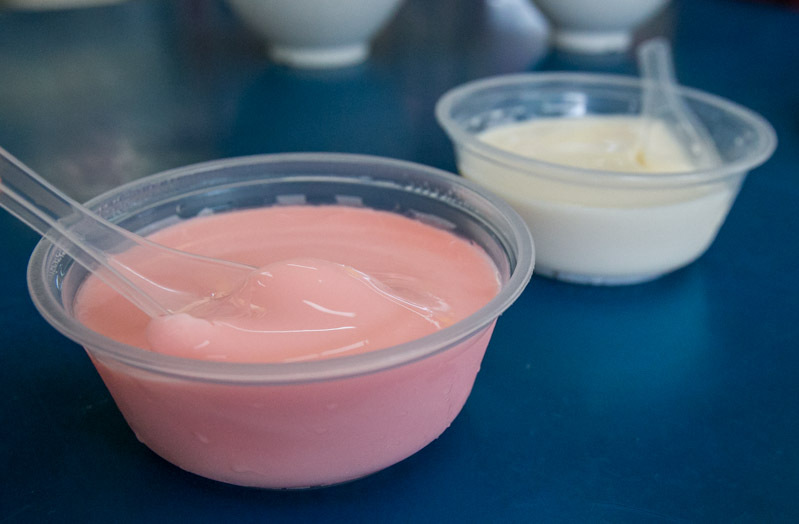 Their soya beancurd puddings are freshly made on-site daily and are available in more than 10 flavours (such as peach, durian, chocolate and passionfruit). We had the Original (S$1.50) and Strawberry (S$1.50). While I’m usually hesitant to try flavoured soya beancurds, I really liked this one as it was not too sweet. Nothing is more satisfying on a sweltering hot afternoon than cooling down with our all-time favourite ice-shaved desserts from 美味甜品 Mei Wei Dessert. The Aloe Vera Jelly (S$2.50) features a bowl of shaved ice covered with aloe vera and aiyu jelly. You have to squeeze the lime into the dessert for a refreshing kick. 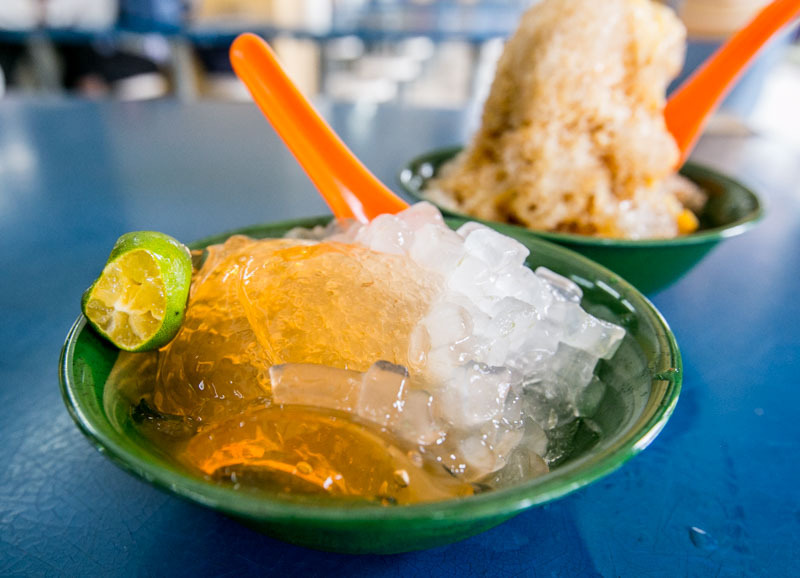 If you’re bored of your regular ice kachang, try the Gula Melaka Ice Kacang (S$2.20). 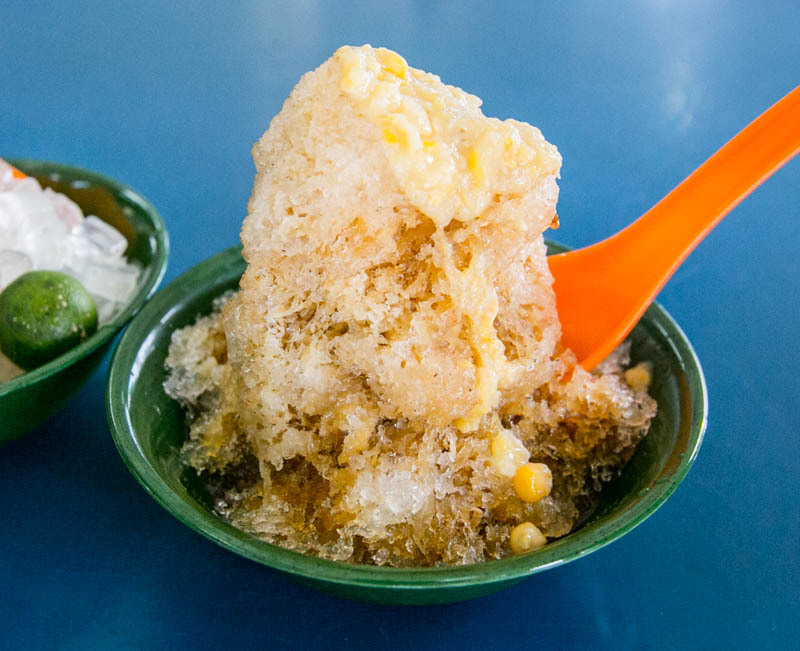 The mountain of shaved ice is drizzled with gula melaka (palm sugar) syrup and canned sweet corn. As you dig into the heap of ice, you’ll be able to find grass jelly, agar agar, atap chee hidden underneath. This zhng-ed version of your ice kachang is the perfect sweet treat for a hot afternoon.